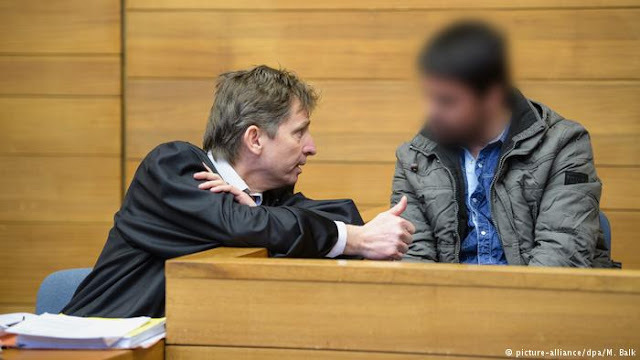 (Traunstein) A 30 year old Afghan man who murdered a 38 year old mother of 3 also from Afghanistan, received a life sentence (15 years) yesterday, he will also be deported on his release. The man, fatally stabbed the 38-year-old woman, in front of a supermarket in the Bavarian town of Prien am Chiemsee in April last year. The act was carried in front of the woman's sons, aged 5 and 11 at the time. She had converted to Christianity while still in Afghanistan, had lived in the town since 2011 and was involved in the Protestant church community and barely knew her attacker. In court the man's lawyer, had appealed for leniency, saying his client had from an early age faced violence, blood and death." The attacker, who is illiterate and had undergone psychiatric treatment before the murder, claimed that the woman had called on him several times to convert to Christianity as well. He said this had been hard for him to accept as a Muslim and "disturbed his mind. ", that said his story has changed, initially he stated he had acted out of frustration about his looming deportation as a rejected asylum seeker. That was followed by he couldn’t remember killing the woman, then after a quick visit from his lawyer his excuse changed to the one present above. That she had tried to convert him. Despite openly stating he barely knew her. The oldest son of the victim told reporters present at the reading of the sentence that he hoped the accused would "receive the punishment he deserved" and not be sent back to Afghanistan, where he would be "celebrated for what he had done."